In my fantasy novel, I have a character who gets attacked by a cross between an orc and a werewolf. Well, he tries to stop an attack on someone else and gets his leg clawed. The outcome I want from this is for the character to have a permanent limp as a reminder of the day a myth appeared and sliced him up. Where would be a plausible place to be cut by three claws (and how deep) to cause such a limp? To answer this question, I sought out the expertise of Rob, a fellow med student with a special interest in Physical Medicine and Rehabilitation (PM&R). Rob the great! Rob the wonderful! Rob the red-headed! Seriously. Wave at him. He spent a good amount of time helping me out. I don’t see you waving. Fine. Be ungrateful. I’m sure he understands. He’s just nice like that. At least I appreciate him. “Limp” is a layman’s term to describe a disturbance in a person’s gait, or normal pattern of walking. Initially, the change in your character’s gait would be caused by inflammation at the site of injury. It hurts, so he doesn’t do what he would normally do walking-wise. However, that alone won’t cause a permanent limp. Unless there’s constant inflammation, like from a localized but persistent infection. His gait would minimize the time spent on the injured side. The woman in this video walks with an antalgic gait. Which side is the painful one? After the injury had healed, the gait disturbance pattern would be dependent on where the injury occurred. 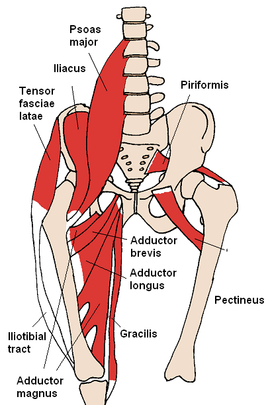 The hip girdle drops on the injured side with the trunk sort of swaying over it to maintain balance. This video is a little over-exaggerated, but it’ll give you the general idea. This could come from the development of scar tissue around a joint. Basically, it prevents the leg from bending properly during the gait cycle. The character would walk with a straight leg. Get up and try to walk with a stiff, straight leg. Damage to the peroneal or tibialis anterior nerves would give your character a “foot-drop gait”, also known as a “steppage” or “equinus” gait. If the character’s peroneal or tibialis anterior nerves are damaged, the muscles that keep his foot in a 90-degree orientation will not work. So basically, his toes will drop down to the floor every time he lifts his leg. He will compensate for this by lifting his leg higher, so he doesn’t trip over his own toes. If he wants to hide his limp, he could wear a shoe or a boot that holds his foot firmly in the proper 90-degree orientation. The thing about nerves is that they are capable of growing back (very, very slowly) to bridge clean cuts such as the one that might be caused by an orc/werewolf hybrid’s claw injury. However, the nerve could also be compressed by the development of scar tissue, and that would make it much less likely that the nerve would be able to regain its usual function. So, which should you use, dear reader? Rob thinks you should go with a circumduction gait, perhaps via a claw injury to the knee itself or surrounding structures. Your character could develop extensive scar tissue, which would hold it stiff and rigid. But, there alternatives if you don’t like Rob’s idea. And you want to make him cry. Especially since you also didn’t wave at him earlier. Your character could also get a foot-drop / steppage gait from scar tissue compressing the peroneal or tibialis anterior nerves in the lower leg. If you want a trendelenburg gait, he should be clawed deeply over the hip girdle area. If you want an antalgic gait, consider giving him a persistent, low-grade infection as a source of ongoing inflammation. But that would change a lot with time, and may be life-threatening as well. I’d suggest that it doesn’t fit your scenario quite as well. Hope that helps! Rob and I both thank you for writing! If you use this as if it were real medical information, I’ll sic Rob on you. Don’t laugh. He’s wonderful, great, and red-headed. . . but he’ll totally take you down. You have been warned. Actually, this — as are most of your posts — was really interesting. I’ve got three characters in two totally different worlds who have limps. I now know what kind of limp each has! Thank you, Drs Grasshopper and Rob!